Employee representation on Boards is usual in many large European companies, either in Boards of Directors or in Supervisory Boards. Employee shareholders are represented on Boards in 13% of large French companies (but 29% in terms of employment). Employee shareholders representation on Boards is thus typical in French largest companies. 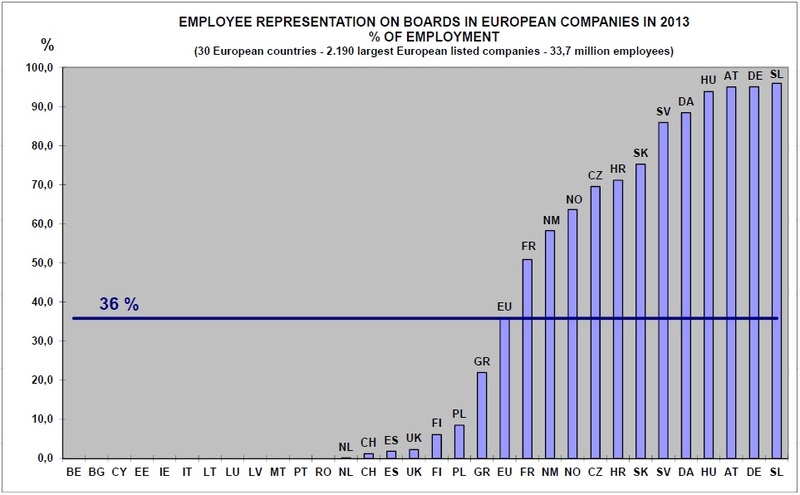 On the other hand, employee representation on Boards is usual for 36% of employees in large European companies (see graph hereafter). This is the case for 95% of employees in large companies in Austria, Germany or Slovenia. In France, it is the case for 51% of employees in large companies (just over the European average), while it is only the case for 2.3% in the UK… and 0% in Italy. This information is based on the EFES database of large European companies, which initially gathered all information about employee share ownership in each of the 2.200 largest European companies. The EFES database was recently extended to corporate governance issues.